Microsoft has once again updated their Android launcher app, Arrow Launcher, with some nice improvements. The update, version 1.4 for those keeping score at home, brings several improvements in user controls. For example, you can now hide page headers, a feature that many users of the launcher had requested. Users can also hid SMS preview on the People and Recent page. This change is done in the Settings of the launcher. Both of these changes represent the fact that Microsoft is indeed listening to users of their apps as both were heavily requested changes. Another change that Arrow Launcher now has is an improved App Drawer. The drawer has now has separated apps and widgets which, as Microsoft states, will make the drawer cleaner and faster. Speaking of speed, Microsoft also states that the launcher is much faster with a lower memory footprint. All of these things add up to a pretty good release that users of the app will want to get on their devices soon. The update is currently rolling out in the Google Play Store and should be coming to users as an OTA update over the course of the next few days. Microsoft continued commitment to Android and iOS as part of their “Mobile First” strategy is paying real dividends for users of their apps and services. 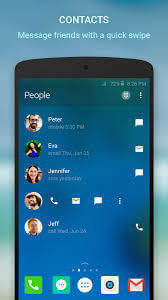 Arrow Launcher represents just one of dozens of apps the Redmond, Washington company has available for Android. If you depend on Microsoft services for home and/or work, there is no reason an Android device won’t let you get the job done. You can download Arrow Launcher from the Google Play Store for free.